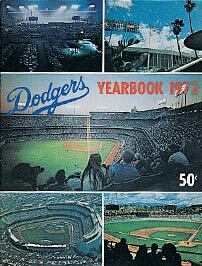 Top-notch pitching was the success story in 1972, but the Dodgers failed to make the postseason as they finished 10 1/2 games off the pace and tied for third in the N.L. Western Division, in large part because of shaky defense (162 errors in 155 games). The Dodgers ranked first in N.L. pitching with a 2.78 ERA and 23 shutouts. The first eight days of the season were canceled due to the first players’ strike, which ended on April 10. The Dodgers lost seven games on the schedule. Right-hander Don Sutton made the All-Star team and had a stellar season, with his 19-9 record and 2.08 ERA in 273 innings pitched. Southpaw Claude Osteen became a 20 game winner for the second time as a Dodger. Another left-hander Tommy John, who arrived in Los Angeles via trade, went 11-5. 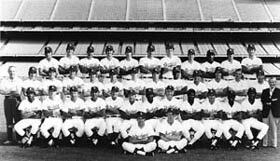 Center fielder Willie Davis, the “Three Dog,” had a successful season at the plate, leading the Dodgers in almost every offensive category, including average (.289), hits (178), RBI (79) and home runs (19, tied for lead). New acquisition Frank Robinson added 19 home runs to tie Davis. Manny Mota batted a team-leading .323, while outfielder-first baseman Bill Buckner hit a solid .319 and was hard to strike out with only 13 whiffs in 383 at-bats. 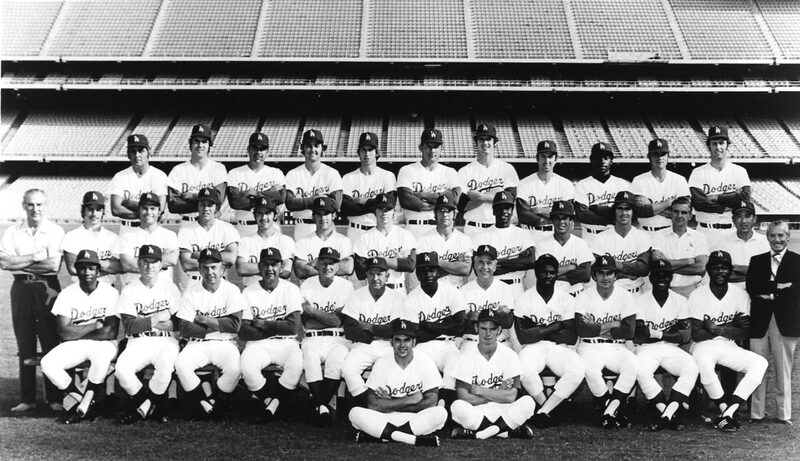 Shortstop Bill Russell batted .272 for the Dodgers, who won nine of their last 12 games. Davis and Mota each hit inside-the-park home runs in a loss to Pittsburgh on June 11, tying a major league record for two in one game. A total of six home dates were lost due to a players’ strike. On June 4, the uniform numbers of Dodger Hall of Famers Jackie Robinson (42), Sandy Koufax (32) and Roy Campanella (39) were retired by the organization in an on-field ceremony. 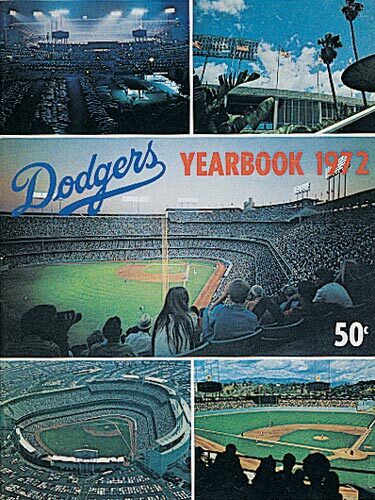 Click image for a larger view1972 Dodger YearbookCopyright © Los Angeles Dodgers, Inc.
Click image for a larger view1972 DodgersCopyright © Los Angeles Dodgers, Inc.
Walter O'Malley, Chairman of the Board; Peter O'Malley, President; James A. Mulvey, Vice President; Sylvan Oestreicher, Treasurer; Harry M. Bardt, H. C. McClellan, Robert L. Gordon.